There were these potato chips, which sadly you cannot find anymore, from Snyder’s of Hanover. They were steak and onion flavored. My husband loved them, and took great delight in introducing them to others. “You can’t just eat one, you have to try three,” he would tell people. Why three? Because the first time you tried them, the first chip was just bizarre, your taste buds were overwhelmed with the sheer weirdness of it all. The second chip, you would start to notice the steak flavor, and attempt to process it all. With the third chip you would realize they were great! A potato chip that tastes JUST like steak and onions! How perfect! One can say much the same of Passion Pit’s first album “Manners”. 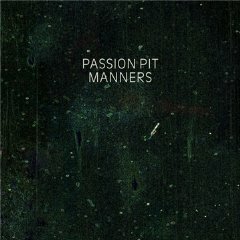 At a first listen, Passion Pit’s debut album “Manners” seems to be nothing but sounds that shouldn’t work together: high light male lead vocals, disco rhythms that could easily work for doing The Hustle, catchy pop hooks, and lyrics of a depth that they could be read aloud as poetry. I have to admit, when I played it through the first time I found it a confusing, but enjoyable experience. Having heard their song “The Reeling” on both of my favorite online radio stations (that would be Indie 103.1 and WEQX 102.7, thank you for asking) I was prepared for a more electronic, dance feel (Despite hearing it initially on “alternative” radio stations. Of course now I hear it on my favorite online dance station too, 1Dance.FM, thank you again for your interest.). On a second listen, things started to mesh together nicely. The album is infectious. I can’t listen to it without tapping my foot or swaying in my chair. I realize that Passion Pit is almost like a Bee Gees 2.0, an updated, next generation version. And let me take this moment to proudly announce to the world that I love the Bee Gees, you hear that world? Love them! I had an awesome Bee Gees lunch box in elementary school and it’s one of my greatest regrets that I don’t have that lunch box here with me now. Ain’t no shame in liking some foot tapping tunes, and Passion Pit gives you the foot tapping fun of disco, with a hip, updated sound. By the third listen I’m enamored. Passion Pit’s album “Manners” is high light male lead vocals, disco rhythms that could easily work for doing The Hustle, catchy pop hooks, and lyrics of a depth that they could be read aloud as poetry! How perfect! “The Reeling” that is a link in the previous text goes to the official music video on You Tube, unfortunately they don’t allow embedding. I did however find this live performance from Passion Pit at a radio station, which I can embed….so I did.